Every year Thresholds Theatre Art Program brings together Chicago theater professionals and individuals with mental illness to craft an original show that explores mental illness’s impact through song, poetry, movement, monologues and story theatre. 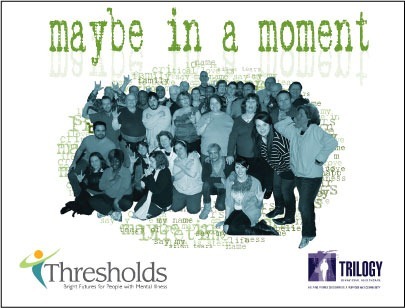 Members of Thresholds’ programs enjoy a therapeutic and artistic outlet for their stories, to express what it is like to suffer mental illness and their audiences receive an education as to its tangible realities. However, under Artistic Director Marti Szalai-Raymond’s direction and development, Thresholds’ latest show, Maybe In a Moment doesn’t just have educational benefit for general audiences. It’s actually a substantial and poetic piece, quite reminiscent of 60’s experimental theater. The cast pulls together with teamwork and grace, putting across simply profound and revelatory moments. If anything, Maybe In a Moment is about surviving and experiencing each day, no matter what the day might bring. Songs and poems tap into basic needs—to love and be loved, to feel connected to community, to be accepted and appreciated, to live without shame, secrecy, fear or stigma. Though their difficulties may be unique to their own individual lives, Thresholds members still serve up a heaping helping of the human condition. The production’s story theatre style allows most to have their moment to express an element essential to their personalities. “If you have a gift and you don’t share it, it’s no good,” declares one man. “I’d like to be remembered as somebody smarter than I am,” says another. “Today, I saw a new doctor,” says one man, expanding on his fear of the treatment he may face from a new and unfamiliar healthcare provider. “This year was our first time trying to bridge the hearing and deaf communities,” cites Szalai-Raymond. “Not all of our members are going to learn to sign in time for our opening. Some even have physical challenges for signing. So, it’s taken a lot of patience. Movement was a place where we could meet in the middle. Plus, this is our first time playing in Viaduct Theatre’s space. We didn’t even rehearse here before opening.” That’s not something that one could tell from the performance. If anything, the cast’s ensemble cohesiveness, in spite of an occasional mistake here and there, belies a family or community feeling of gentle respect. Once Threshold’s production wraps up at Viaduct, it tours schools, churches, community centers, hospitals, national conferences and the like. Theirs is a message of hope, kindness and encouragement to heal any heart, challenged with mental illness or not. Maybe in a Moment continues through May 8th at the Viaduct Theatre, 3111 N. Western Ave., with performances Thursdays-Saturdays at 7pm and Sundays at 3pm. (fyi: the Friday, April 29th show will be performed at the Woodstock Opera House). Tickets are $20, and can be purchased by phone (773-296-6024) or online through ticketweb. Marti Szalai-Raymond (artistic director); Diana Laffey (assistant / music director); Greer Beckman (assistant artistic director); Heather Lindahl (production manager); David Rocco Facchini (stage manager); Katt Janson (assistant stage manager); Lorraine Long (graphic artist / set construction); Ellie Wallace (scenic artist / set construction); Gail Bedessem and Sheila Kettering (interpreters).